If I made a list of the top 10 things I love to eat, I feel like at-least 7 of them would be chicken dishes. 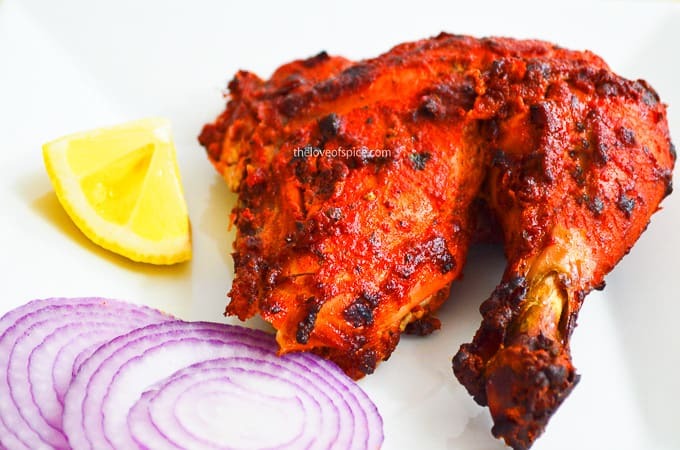 And Tandoori Chicken is really high on that list, because it’s just impossible for me to resist the lure of perfectly spiced, tender and succulent pieces of chicken, traditionally roasted on the tandoor, but in this case, in my home oven. However, for many years, we only made the tandoori drumsticks or legs (which is what we typically get in restaurants) as it was quick and easy and really, really yummy. 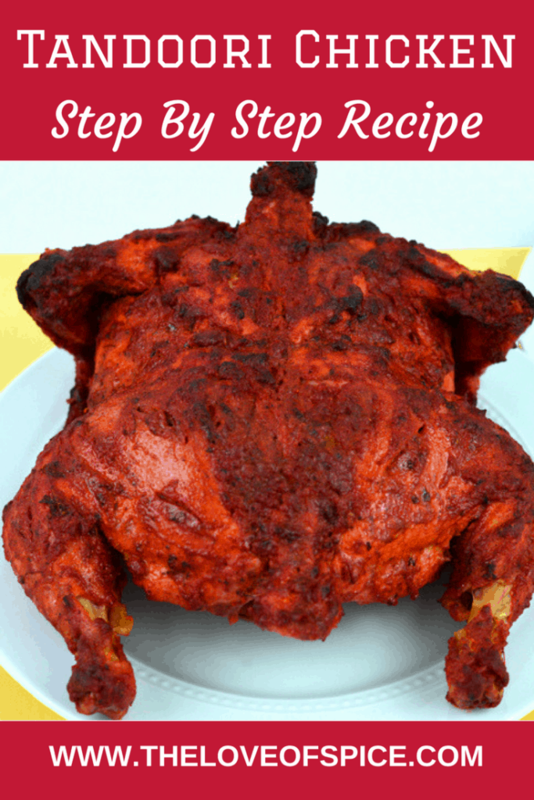 But my husband wanted us to try roasting the whole chicken at home in tandoori spices, and while initially I found it a little intimidating, I tried it out anyway, and boy oh boy, this was a whole different level of deliciousness. Moreover, once I got the spice mix right (which took a fair amount of experimentation), this hardly took much active cooking time, because it took only about 10 minutes to clean, 10 more minutes to marinate, and then finally 10 more minutes to prep and set it in the oven. Of-course you need to let it marinate for about 24 hours, and it takes a little over an hour in the oven to cook, but there is nothing that you need to actively do during this time. Also, whenever I have made this over the years, it’s been a sure-fire crowd-pleaser, and it’s also been the recipe that I’ve been asked about the most, which is why it absolutely had to be the very first recipe I share on this blog. 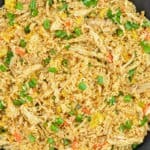 This dish will make for a great replacement for Turkey on your Thanksgiving table, and can even be the star of your Holiday or New Year Party. It is best served with Coriander Mint Yogurt Chutney, some lemon wedges & raw onion rings on the side. As far as we are concerned, it is one of the staples of most gatherings we have. Though, we often make it even when we don’t have guests at home, in which case, after we have gorged on the tandoori on the first day, we use the leftover chicken (mostly breast meat), and separate it into bite sized chunks to use it for Tandoori Chicken Taco the next day; it’s resourceful and still very delicious. Remove the skin and giblets (in case they come with the chicken) and discard them. I know some people (like my husband) use the giblets, in which case you can feel free to apply the leftover spice mix to them, and roast them along with the chicken. But as far as the skin goes, you need to take it out from everywhere, though you can keep the skin on the wings if you want to. Once you have removed the skin, clean the chicken thoroughly – inside & out. Once that is done, pat it dry really well with a paper towel, and make several gashes all through the chicken (for the spices to absorb better). Mix together the lemon juice & salt really well. Apply this mix to the chicken to tenderize it, before you apply the main marinade to it. You need to let the chicken sit in this mix for about 20 mins, but if you feel like you cannot get the liquid everywhere, you can first apply the mix all over the whole chicken, and then let one side sit in the lemon salt mix for 10 mins, and then flip to the other side for 10 mins. 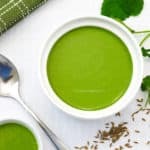 In a bowl, (in the quantities mentioned above) take yogurt, ginger garlic paste, oil, salt, kashmiri chilli powder, garam masala powder, coriander powder, cumin powder, tandoori masala powder, chaat masala powder, cornflour, kasoori methi powder & mix all of it really well. This will give you a smooth paste like marinade ready to be applied to the chicken. You can also add in red colour, if appearance is really important to you, but I leave it out most of the times, because taste-wise it makes zero difference. Anyway, once you have this marinade ready, apply it all over the chicken, especially in the gashes that you made earlier, and set it aside to marinate in the fridge for about 18-24 hours. I know, 24 hours seems like a long time, but if you stay patient, you will realize that the flavor is worth the wait. Having said that, in case you are short on time, you can definitely cut the marination time, but I’d still recommend to wait for at-least 4-6 hours. 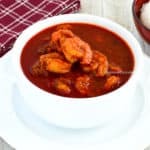 Once you have let the chicken marinate well, take it out of the fridge, and set it on the counter to thaw for at-least 30 minutes, before you put it in the oven, because you don’t want to expose the chicken to extreme temperatures within a matter of few minutes. However, at this point, you can start prepping the chicken to get it ready to go in the oven. Now, this part is completely optional, but highly recommended. And I’ll tell you why. 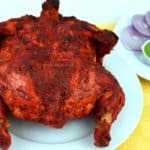 Do you know how in the restaurants, the tandoori chicken has this crispy (for the want of a better word) skin on the surface? I personally love that. But to be honest, in the many years I made the tandoori chicken at home, for the longest time, no matter how good it tasted, I could never replicate that outside texture. I mean it was always perfectly juicy on the inside and also tasted amazing, but it just did not feel right on the outside, and it’s been something that has always bothered me. So you can imagine my joy when I finally figured it out, and it’s something I have to share with you all, because that restaurant-like outside texture is ridiculously simple to achieve. The secret to getting perfectly crisp tandoori chicken skin (while keeping the chicken moist & juicy on the inside) is merely sprinkling some cornflour on the chicken before putting it in the oven. I’ll run you through the steps. Get out the roaster (on which you will set the chicken to bake in the oven), and place the whole chicken on it face up. By face up, I mean that place the chicken on the side you want it to be when you finally take it out. I am only mentioning this, because you will be flipping the chicken twice during the roasting process, so it’s simpler to put it on the side you want it out. Okay, so now once you have the chicken set on the roaster, dust cornflour on it through a tea strainer (so that you don’t accidently dump a lot of cornflour) & also put a little oil over the chicken, and set it aside. It’s now ready to go in the oven. If you noticed, I only told you to sprinkle cornflour & oil on one side. It’s not an oversight, I’ll come to the second side in a bit. Of-course this whole, oil & cornflour thing is optional, but highly recommended to get that perfect restaurant-like texture. Note: Before you actually heat the oven, it might be helpful, if you rearrange your oven racks, so that the rack on which you will place the chicken to cook is positioned right in the center of the oven, just so that there is enough place for the whole chicken to fit in comfortably, and everything cooks evenly. Once you have done that, preheat the Oven to 425 F.
When the oven comes to temperature, put the chicken in the oven for 30 minutes. At the 30 minute mark, take the chicken out, and flip it on the other side. Now sprinkle some oil & dust the cornflour on this side as well, and put the chicken back in the oven for another 30 minutes. At the 1 hour mark, take the chicken out again, and flip it back to the side you first put it in, and put the chicken back in the oven for another 15 minutes. Now this 15 minute mark is approximate. You can always do a temperature check to be sure the chicken is cooked all the way through, by inserting a kitchen thermometer in the thickest part of the chicken thigh. If the temperature reads 165 F to 170 F – the chicken is cooked. But in the absence of a way to accurately check meat temperature, an additional 10-15 minutes is about the time it will take for the chicken to cook completely. I’ve done my very best to share the exact measurements, and outline every step, but if something is not clear to you, or you have questions about quantities or alternatives, or anything at all, feel free to ask in the comments. I promise to reply to every single query. 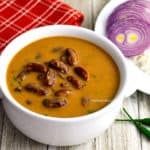 If you like the recipe, please follow The Love of Spice on Social Media (links below) to stay connected with new recipes out every week. And if you make the recipe, please do tag me in the pictures, or let me know how it turned out. I’d love to hear from you. That’s stunning! 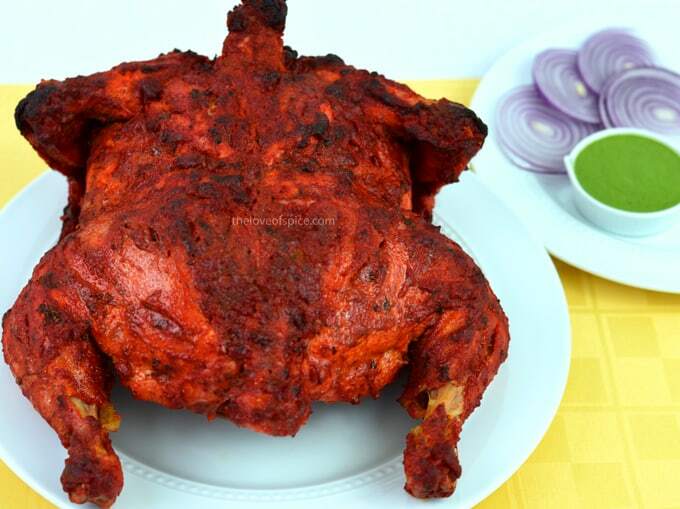 Dad makes Tandoori chicken like this. I’m still intimidated to grill a whole chicken. Heeee. Many many congratulations once again on the brand new blog. Here’s to many many more. 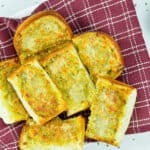 Congratulations on the food blog! You finally did it. Ah..I haven’t yet tried tandoori in an air fryer. Which brand do you have? Looks good and want to give it a try. Looking forward to more recipes. I hope you get to try it out, and enjoy it as much as we do. I would love to hear how it turned out. 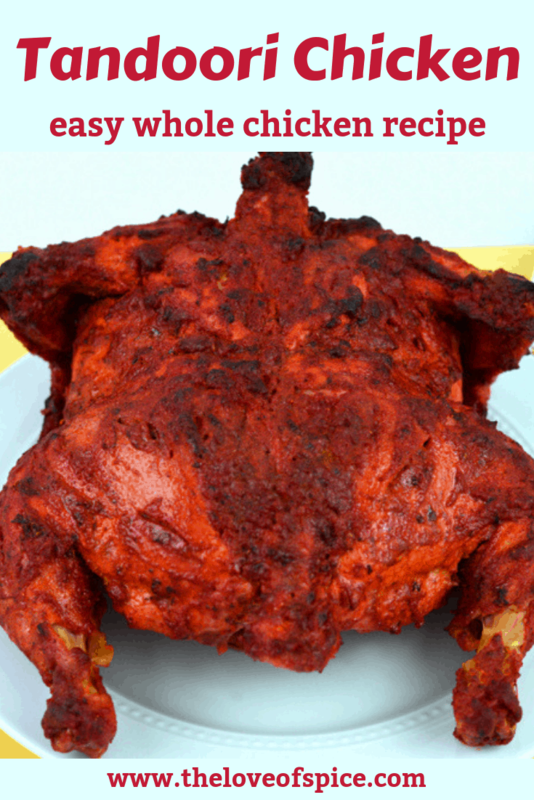 The first recipe here is a chicken recipe and a whole tandoori one at that! I love this place more now. Congrats on starting the food blog again and I'll be back to check this place soon. Congratulations on this new space. Chicken is not really my thing but it does look delicious. Firstly, Congratulations on the launch of your food blog! 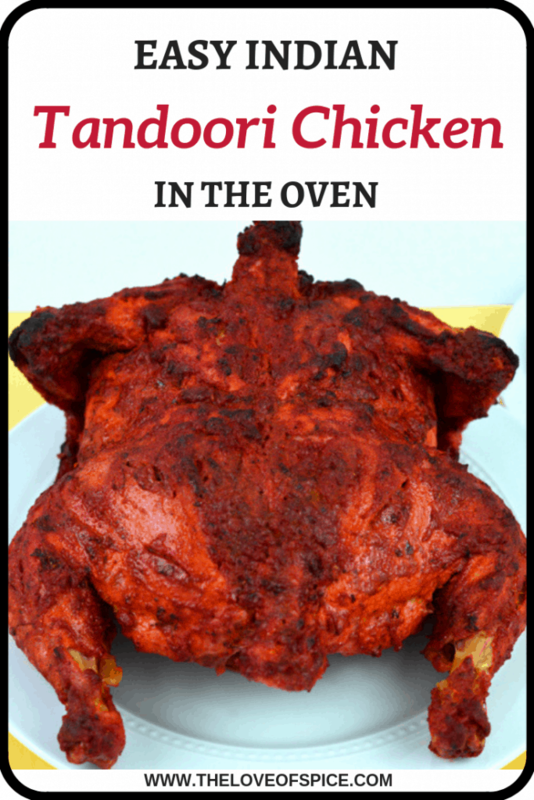 The Tandoori chicken recipe looks great. Pretty precisely written Shantala, much helpful for learners. It’s my favourite too, will surely try it soon. Thanks for sharing. Between, waiting for the chutney updates ? Awesome! It does look delicious! I do hope you will share your recipe for tandoori chicken taco too! 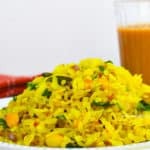 Wow, looks super yummy, Shantala. I am drooling here. 🙂 I don’t know if I have the patience to try out this recipe but I’m tempted. Looking forward to many more lip-smacking recipes from you, Shan! Looks delicious! I’ve never ever in my life cooked an entire chicken but I might use the recipe with chicken breast fillets 🙂 Congratulations on the launch! Thank you, Sanch. 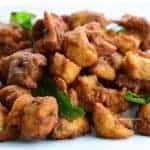 Oh and using the masala for breast fillets will work just fine too, but if you can, try it with (boneless, skinless) thigh fillets also- they turn out more juicy, as they don’t dry out as easily as breast meat does. Your recipe looks flawless, so does the technique! What I am somewhat ambivalent about is the fact that you talked about making it in the oven, then discussed about making it in the air-fryer, but never about making this dish in a Tandoor! Granted that Tandoor is not an easy thing to come by but if you are writing in a blog, then the idea deserves consideration! When you do find one, this dish will become 10 times better, simply because of the consistent high temp you can achieve in a Tandoor! 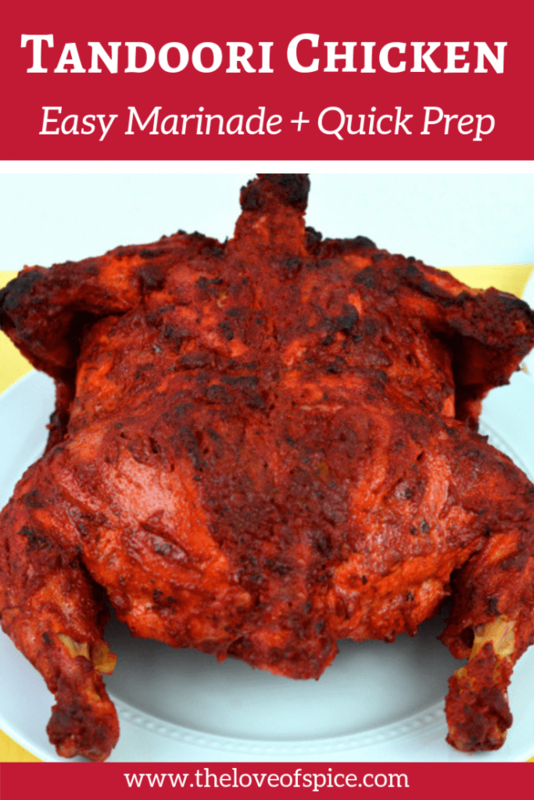 I used Kamado style grills as my Tandoor and I can assure you, this recipe will make a rockstar chicken in my Tandoor! Hi Ansh, I completely understand your point of view. Yes, I did not mention anything about making this in a tandoor, because the point of this recipe was to give readers step by step directions to make tandoori chicken at home, not necessarily in a tandoor. Because like you agree too, most of us don’t have access to a tandoor oven. That being said, I completely agree that this dish will taste a whole lot better if made in a tandoor oven. And I hope to try it out someday. Till then, thank you for reading, and caring enough to share your thoughts. I truly appreciate it.